Being a student at Americus High School was the worst experience of Greg Wittkamper’s life. Greg came from a nearby Christian commune, Koinonia, whose members devoutly and publicly supported racial equality. When he refused to insult and attack his school’s first black students in 1964, Greg was mistreated as badly as they were: harassed and bullied and beaten. In the summer after his senior year, as racial strife in Americus—and the nation—reached its peak, Greg left Georgia. 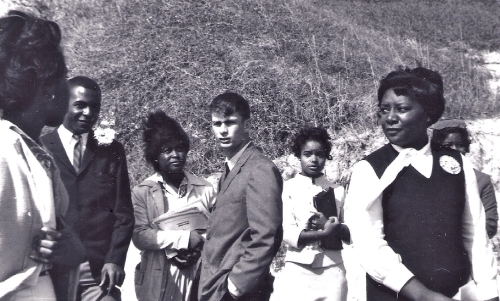 The Class of ’65 is more than a heartbreaking story from the segregated South. It is also about four of Greg’s classmates—David Morgan, Joseph Logan, Deanie Dudley, and Celia Harvey—who came to reconsider the attitudes they grew up with. How did they change? Why, half a lifetime later, did reaching out to the most despised boy in school matter to them? This noble book reminds us that while ordinary people may acquiesce to oppression, we all have the capacity to alter our outlook and redeem ourselves. Greg felt the circle of boys closing around him. He was badly outnumbered and knew it wouldn't be a fair fight. As he turned away from the underclassman and back toward Thomas, the mob finally got what it had been screaming for. Thomas balled his right first and swung, striking Greg directly on the left cheek. He staggered and felt his knees buckle, but he didn't fall. Through the stars in his eyes and the ringing in his ears, a biblical vision came to him. He imagined Thomas as a young Roman soldier and himself as Jesus. It was a passion play, and he knew his part. Greg stepped closer to the boy who had just hit him and jutted out his chin as if awaiting another blow. "I love you, Thomas," he said. The two stared at each other. Thomas said nothing. He looked confused. His arms seemed to fall limp.